Okay, you've heard of this "Grim Fandango" game for years and everyone seems pretty excited it's been re-released, but what the hell is it? Any relation to the WWE wrestler? How about the excellent-but-also-underrated/canceled cartoon Frisky Dingo? 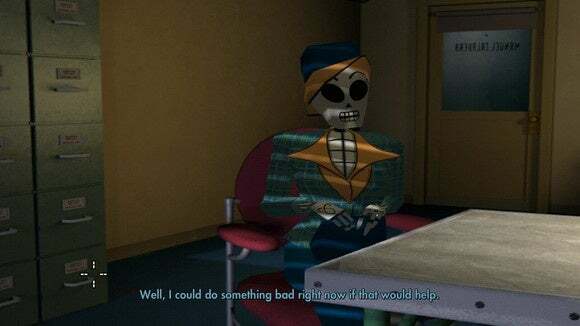 Grim Fandango is a classic adventure game from Tim Schafer and Co. released right before LucasArts stopped making classic adventure games. In other words, the long-distant past of 1998. You play the part of Manuel "Manny" Calavera, who looks a lot like the Grim Reaper until he takes off his cloak and takes off his stilts and folds up his scythe and reveals he's...a travel agent. No, seriously. When you die, you end up in the Land of the Dead where you must embark on a four-year journey to the Ninth Underworld. Here's Manny presiding over a freshly-dead soul. If you were a good person, however, you can skip that whole "four-year journey" thing and travel in style—by car, by boat, or by the fabled "Number Nine" train, which can get you to the Ninth Underworld in mere minutes. Manny's job is to sell these travel packages. There's a huge conspiracy afoot in the Land of the Dead though, and it's up to Manny to solve it. Someone is stealing Number Nine tickets from good people and leaving them to the four-year walk. And when it happens to one of Manny's clients, well, that's when things get interesting. It's a seedy noir film mixed in with Aztec/Mexican views of the afterlife. Frankly, it's one of the most unique and clever settings ever to make it into a video game, and shows off Tim Schafer and LucasArts at their prime. The game also sold terribly, so it's unlikely you've played it unless you donned an eye-patch in the last fifteen years. 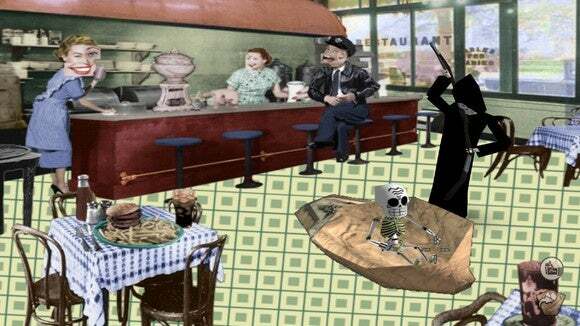 You should play Grim Fandango Remastered. It's great. Some caveats: It's a 90s adventure game, meaning it is full of asinine puzzles where the solutions barely make sense. If you haven't played before, you're going to get stuck. Just do yourself a favor: Open a walkthrough, read the solution, say "Wow, that's asinine," move on, and continue enjoying the game's excellent writing. Don't let the game ruin your enjoyment of the game. Because it could. Really easily. Seriously, and I can't say this enough, some of the puzzles are absurd. Okay, you want an example? How about "There are beavers that are on fire and you have to lure them to jump off a cliff and shoot them with a fire extinguisher so they drown in a tar river"? Is that asinine enough for you? Because I almost had an aneurysm typing it. Now with that out of the way, let me talk about the "remastered" part of Grim Fandango Remastered. This is Grim Fandango Remastered, meaning it's basically a prettied-up version of Grim Fandango. Don't go into this expecting as extensive a remake as, say, Gabriel Knight: Sins of the Fathers. 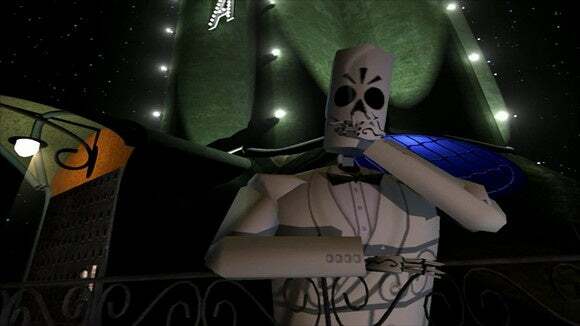 Instead we get Grim Fandango but smoothed out a bit for modern high-resolution monitors—smoother edges on 3D objects, for instance. At times it's stunningly gorgeous—there's almost a claymation feel to certain scenes. Other times, a bad model or awkward shading reminds you that yeah, this is a game from 1998. Your pal Glottis is the worst of the lot, with some weird bulgy arm muscles that tend to clip through each other. The 2D backgrounds also could use work. Most, if not all, have clearly just been resized to fit the higher resolutions, resulting in grainy and blurry backdrops that look entirely out of place compared to the smooth character models. 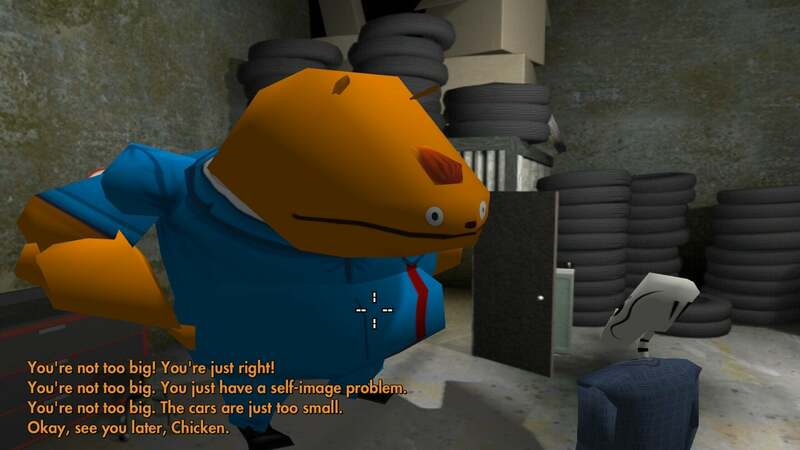 "Glottis...It's about your arms. I think you need to see a doctor." As for accommodating modern monitors, you can play the game in 4:3 (native), 4:3 with some vaguely Aztec or Art Deco-inspired borders on the left and right, or in 16:9 stretched. I played in the latter because I hate borders, but the obvious drawback is that "skeletal" Manny Calavera looks pretty fat, like he's the skeleton of a retired football player. The graphics overhaul on Grim Fandango is spiffy, but honestly people who played the original will probably be most excited about the new controls. 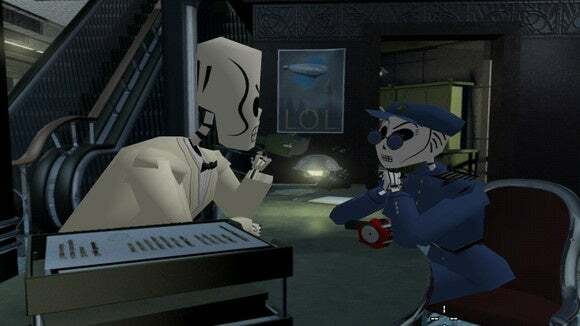 Like Resident Evil (and some other early 3D games), Grim Fandango was all about tank controls. It's a control scheme that kind of makes sense because you're dealing with constantly-changing camera angles, so camera-relative controls are a bit awkward. But that didn't really explain why you couldn't just play Grim Fandango the way everyone expected, i.e. as a point-and-click adventure game. Now you can! The whole game is controllable with the mouse and keyboard, without mods. Or you can play with just the keyboard. Or you can bust out the gamepad and play with either tank or camera-relative controls. There are so many options! Unfortunately, none of them are perfect. The mouse is great because it highlights interactive objects in the environment. However, the biggest problem with the mouse is boredom. A lot of these areas were clearly designed with the idea that you were directly controlling Manny. Watching him run across six empty screens in a row is pretty damned tedious. Keyboard controls are pretty mediocre, but they'll suffice if you don't have a gamepad or if you just love tank controls. My trusty 360 controller was a decent experience, but the game won't highlight interactive objects—instead you'll have to pay attention to which way Manny is looking. Also, some of the camera angles are designed with mouse/keyboard precision in mind, and you can trigger doors by just walking into them (which is a huge pain if you're trying to, for instance, exit an elevator and accidentally trigger it again). I ended up playing with some sort of hybrid mouse/gamepad controls, which ultimately suited my needs fine. Then again, that's why we're PC gamers right? Plenty of possibilities and personal customization. 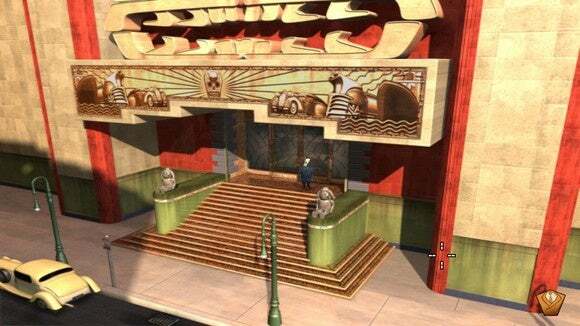 Grim Fandango Remastered isn't perfect. We've had prettier—or at least more extensive—overhauls of some classic adventure games recently, including Gabriel Knight: Sins of the Fathers and Shadowgate (and, I guess, Resident Evil HD since that's kind of an adventure game). 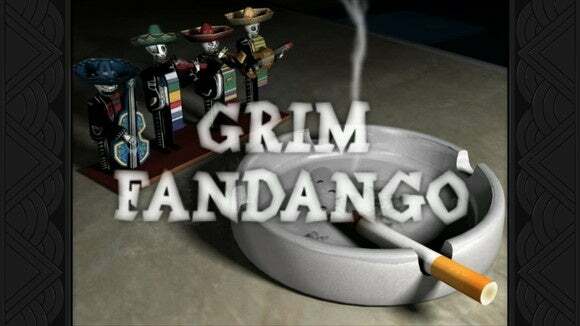 On the other hand, it's [expletive] Grim Fandango. It's a game that's been all-but-unobtainable for over a decade now, cleaned up to run on modern systems with no hassle, and it looks astonishingly good for its age. Is it a 90s adventure game full of adventure game logic? Absolutely. Are the graphics and controls perfect? No. Could it use a bit more polish? Probably. But this is still one of the best video games I've ever played. 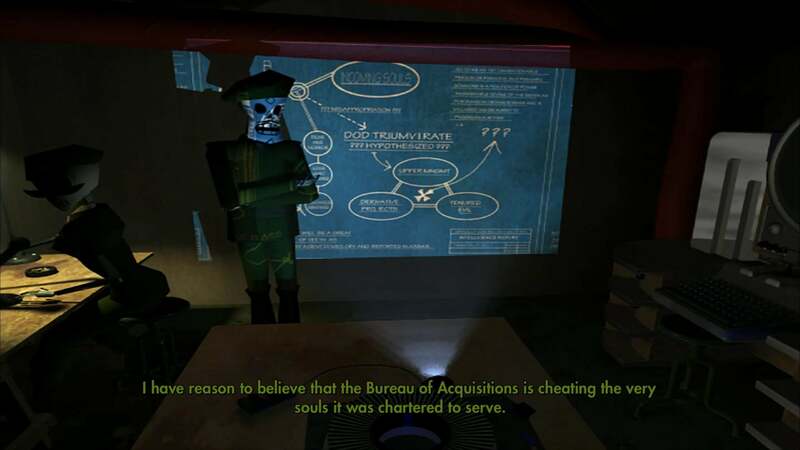 The writing is hilarious, the characters and setting are creative as hell, and along with The Longest Journey I'd say Grim Fandango exemplifies classic adventure games. It's ambitious and mature in a way that not a lot of games before or since have accomplished. Longtime fans? Snag a copy. People who missed the game the first time around but have heard for years how great it is? We weren't lying—snag a copy and play it with a walkthrough, if that's what it takes. There's no excuse now. Nearly impossible to purchase for over a decade, you can now play Grim Fandango and understand why it's one of the best adventure games ever made.